I hear rumors of people who love housework. They patter around the house, singing along with the oldies station on the radio (which, let's face it, feature songs from when I was in college), and smile while mopping the floor. TIP: Set a timer and do as many steps as you can in that time. I set mine for fifteen minutes a day (and move to other rooms if the kitchen/living room are clean or if other rooms need cleaning more). For your first time, you might want to put aside an hour. But maintenance shouldn't take more than 15 minutes in a single room, unless you fail to erase the evidence as you go! There are five easy-to-remember steps: clear, spray, dry, wet, and mop. 1. CLEAR: Clear off flat surfaces. I won't lie. You will HATE this part. But put on your Fit Bit and earn those steps! You won't regret it. When I clear off, I don't just dump things into a basket. I actually take each item and put it away in its home. My hair ties go into a hanging organizer in the bathroom. My keys go in my purse, hanging for a hook on my desk. My kids' toys go in their seats at the kitchen table - for removal to their bedrooms before they get to eat again - tucked under the table so I don't have to look at it. Dirty dishes go in the dishwasher. Folded clothes goes to the closet. PLANNER TIP: Have something with no home? Write a task to "find home" in your planner and put the something in your hold box. Probably the most time consuming part of cleaning any room is clearing off surfaces. But if you do it daily (or almost daily) and as you go through your day, it's also the most rewarding part. TIP: If you have hot spots, decide if that should be the new home of the item. Keys can be corralled in a $1 decorative bowl bought at any thrift store. Thrift store bags and baskets are great for holding library books or mail for your husband. Clearing will have a greater impact than anything else you do, so if you only get to this step today, that is completely fine. 2. SPRAY: Spray and soak raised surfaces. For the longest time, I would spray, wipe, respray, rewipe, spray, wait during soaking, and finally scrub off a spot. Spray any dirty spots and walk away. Next do the dry stuff, while the wet stuff is soaking. Dust from top to bottom, then sweep the floor. 4. 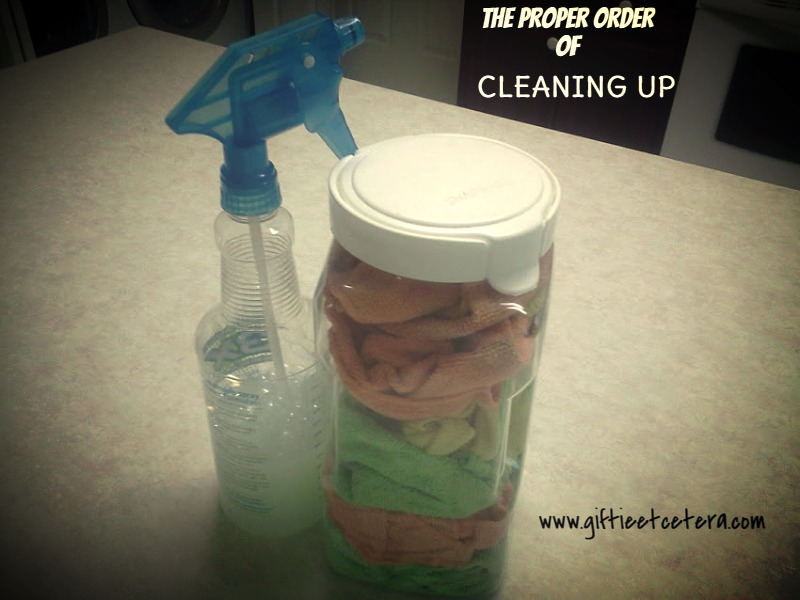 WET: Wipe surfaces, in this order: a) germ catchers, b) high impact, and c) everything else. Germ catchers are places like handles and knobs. Cleaning them first saves you time in the form of not getting sick! High impact areas should be cleaned next. Your house will simply look better. Wipe down that counter and that stove top. Finally, time permitting, do everything else. Clean inside of the microwave and that area on the door that gets footprints on it. But if you don't, no worries. You'll probably be the only one who even notices. I always mop last. (Let's be frank. If I mop, I always mop last.) After all, my food is not eaten off the floor. Only my shoes touch the floor! And if I wait long enough, my 9 year old will beg to mop it for electronics time. 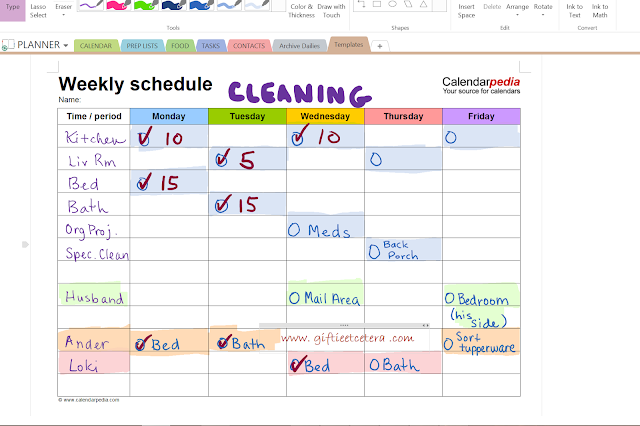 This system will take a while to learn, but logging the time in my planner helped me to be realistic about how long it takes to clean my house. 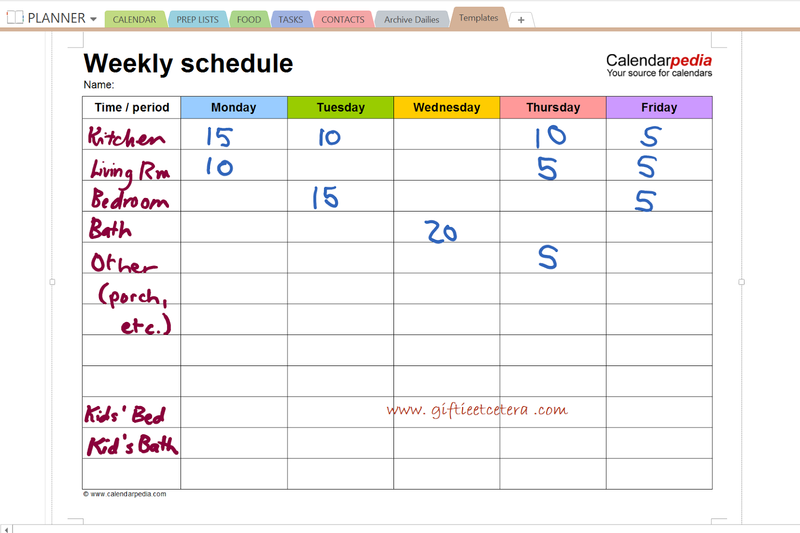 This sample Weekly Schedule (created in OneNote 2013 as a time log) is available in blank form at www.calendarpedia.com (not linked here as I didn't ask them first and don't want to presume). Notice that each room takes less and less time to clean as long as you keep it up! I clean the kitchen (at least through step 4) most days of the week. This printable also is a great way to schedule out your week. Want to chat about cleaning, organizing, and time management? Click on Etcetera below to join our discussion on Facebook!